Who says a luxurious vacation filled with nonstop action and delicious food has to break the bank? North Country Manor Bed and Breakfast is redefining affordable luxury accommodations at its Boonville, NY location. Choose from a variety of rooms, enjoy a new menu everyday, and immerse yourself in an endless array of recreational activities. If you've never stayed at North Country Manor Bed and Breakfast, then you've never experienced North Country or Boonville, NY the way it was meant to be experienced. Find out why all of our customers keep coming back. A deposit of $50 is requested to reserve your room. The deposit is refundable if a cancellation occurs more than seven days prior to reservation date. If the cancellation happens within seven days of your reservation, the deposit will be transferred to another date of your choice. We do not allow pets and we recommend a minimum age of 10 for children. Our bed and breakfast is a smoke-free location, though smoking is permitted outdoors on the grounds. Please be courteous and use receptacles. Oneida City sales tax and occupancy tax apply. Anna's room is named for the daughter of patriarch Walter D. Jackson. 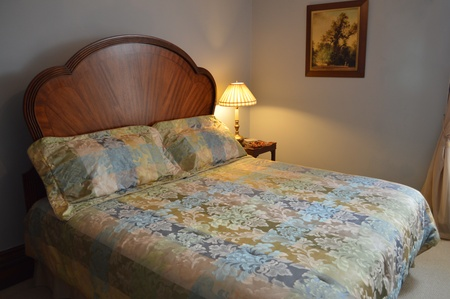 The room is located on the first floor and features a king size bed and a private bath. Named after the son of the original owner, William's Room features a queen size canopy bed and wonderful examples of the original woodwork. Also located on the first floor, this room is named after the wife of Jackson, the original owner. It is furnished with a king size bed and a private bath. This suite is named after the original owner and builder. The room comes with a queen size poster bed, a daybed with a trundle, and a private bath. Enjoy the private sitting area with a fireplace and spectacular views. Ideal for an outdoor enthusiast, the Sportsman's Room is adorned with two full size beds and Adirondack decor.